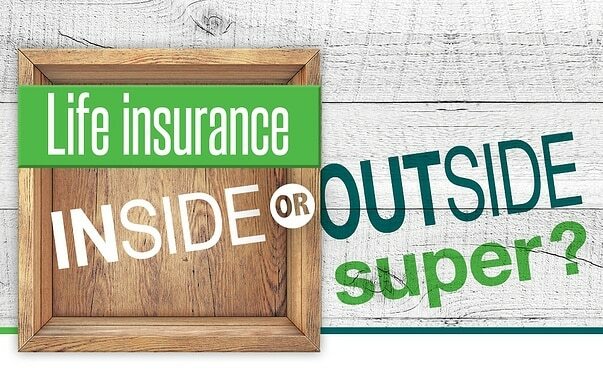 Home / News / Life insurance: inside or outside of super? If you have super, chances are you’ll have some default insurance included and the option to buy more at an attractive price. It’s a cost effective way to get a basic level of cover, but holding insurance inside super does have some downsides. There are three types of insurance you can hold inside super: life, total and permanent disability (TPD) and income protection insurance. Many super funds automatically insure their members and will provide a (relatively small) payout if, for example, they die or suffer a debilitating accident. But the level of default cover is likely to fall short of your needs. Canstar found that while young families typically need around $680,000 of life cover, the average default life policy is only $200,000. You pay for cover from your pre-tax income because the cost of premiums is taken out of the super contribution your employer deposits in your fund. Some life insurance is better than none, but there are downsides of a one-size-fits-all solution. Super funds get bulk-buying discounts on the basis that they purchase standardised ‘off the shelf’ policies. Such a policy may or may not be suited to your individual needs. Automatic default cover also means younger, healthy members are subsidising older and less healthy members. And while paying for insurance out of your super contributions can help your cash flow, it’s money that’s being diverted from your retirement nest egg. You also need to keep in mind that insurance taken out through your super isn’t portable; if you switch to another super fund that insurance will cease. Payouts can take a while because the insurer pays the super fund, which then pays the claimant. If you fail to make a binding beneficiary nomination, or your super fund doesn’t offer binding nominations, the super trustee will decide who gets your benefits if you die. That beneficiary may be taxed more heavily than would be the case with a retail policy. And finally, the insurance ends when you retire. Getting insurance outside of super can be a little more expensive and time-consuming but it’s worth considering for a number of reasons. You’ll have access to a wider range of policies. That means you can find one that’s more tailored to your individual needs. You can’t get trauma insurance through super, but you can in a retail policy. Payouts tend to be faster and you’ll have more capacity to ensure a death benefit goes to the beneficiary you want it to. If you’re in good shape, your premiums will reflect this. While you’ll be using your after-tax income to pay for it, income-protection insurance is tax deductible. Another issue with income-protection policies through super is that they are linked to your current income. This may be unusually low when you make a claim due to, for example, having gone part-time to look after children. In contrast, retail income protection policies can offer a guaranteed benefit. It’s not just big public super funds that can provide insurance cover. If you have your own self-managed super fund (SMSF) you’re legally obliged to consider the insurance needs of members when drafting your fund’s investment strategy. Life, TPD and income protection insurance can all be purchased through an SMSF but it won’t have access to the discounts large funds enjoy. Plus, you generally need to undergo a medical examination before receiving cover, so there are few advantages of holding insurance inside your SMSF. If you would like to discuss the best insurance solution for your family’s needs, please give us a call. For more personal insurance articles, visit our articles library.